The minimum number of people per group is 2. Maximum number of people per group is 15. To arrange a hotel pickup, please let us know. Pickup service from Barreiro costs 15 euros; from Lisbon, cost is 25 euros. It is paid in cash on the spot. The exact start time depends on the weather and sea conditions. If you would like a different start time than listed, please contact us. Swimming ability is required to join this tour. What to bring: Swimsuit, towel, old tennis shoes that can go in the water, and a change of clothes and footwear for after the activity. 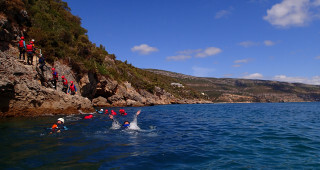 Alternative meeting point is Clube Naval de Sesimbra. We will let you know which location to arrive at in advance. 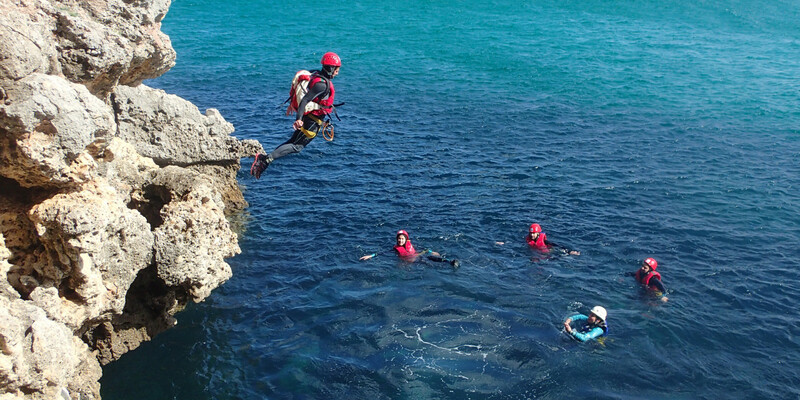 If you're on the hunt for an extraordinary adventure away from the crowds, this coasteering experience - combining basic rock climbing and water activity - is meant for you. 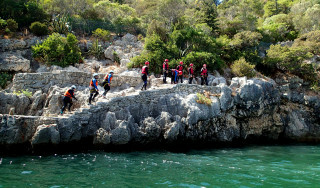 After meeting your energetic guides, you are provided the necessary equipment, safety instructions, and some quick coasteering tips. You and your group then head out towards the speedboat. 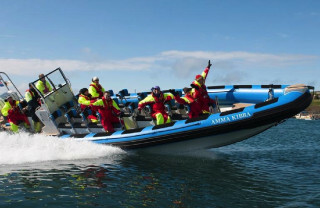 The high-energy nature of this tour is clear as soon as the boat's engine starts roaring. 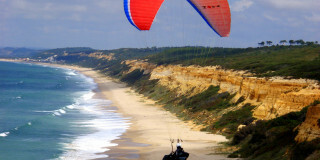 We leave the shore in a wave of white water, speeding towards the Arrabida cliffs. Once the boat stops, the real action begins. You leap into the sparkling water and follow your guide, swimming towards the rocky coastline, where you grab on and begin climbing. The first cliff jumps are only a few meters high, allowing you to practice safely and without fear while looking around at the magnificent views. For the next two hours, you move along the coast, each climb and jump getting higher and more exciting. The views get better, and you get braver, with every minute. 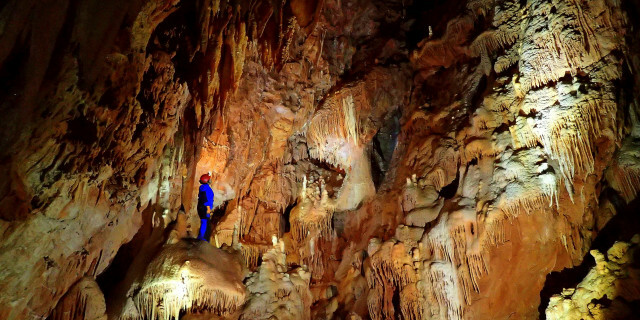 En route, your guide leads you to picturesque caves and caverns while telling you a bit about the area's evolution. After clambering up and across slippery rocky surfaces, a little break is a pleasant distraction. Before heading back to the speedboat, we arrive at the biggest - and optional - jump of the day. At 10 m (32 ft), it's the perfect challenge, and the perfect reward. Just like this entire tour. 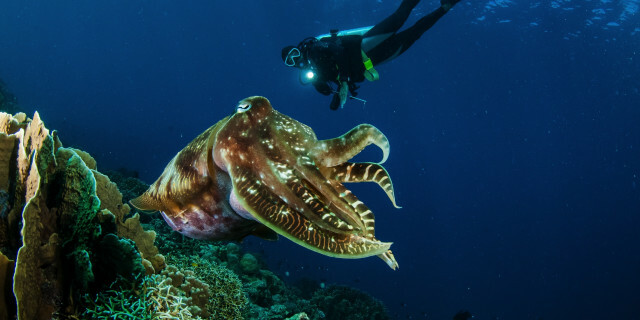 Discover the unbelievable variety of life in Luiz Saldanha Marine Park. The rocky reefs of Creiro beach are home to over 1,000 species, ideal for certified divers looking to explore.